Upon first glance at our dinners last week, you may think we indulged, quite a lot, every night. Nachos, creamy pasta, beef meatballs, meatloaf, many of the phrases and foods we often associate with indulgence. Let’s dig into the dishes, shall we? I’d love to tell you all about them. First of all, on Sunday we celebrated Rosh Hashanah with my family which included a delicious afternoon meal, and desserts, so to say we didn’t really feel like cooking dinner would be an understatement. I had underestimated (whoops) just how much we would end up eating during the day so despite having a plan for dinner available, we skipped it and relaxed on the couch. But! Never forget that I’m always hungry to some degree so much later that evening we found some old crackers and ate those. What? Sometimes we do eat random crackers from the back of the cabinet in place of dinner. Surprise! I think I had a couple random chocolate chips, too. While Sunday’s real dinner was a wash, we got back to plan on Monday night. 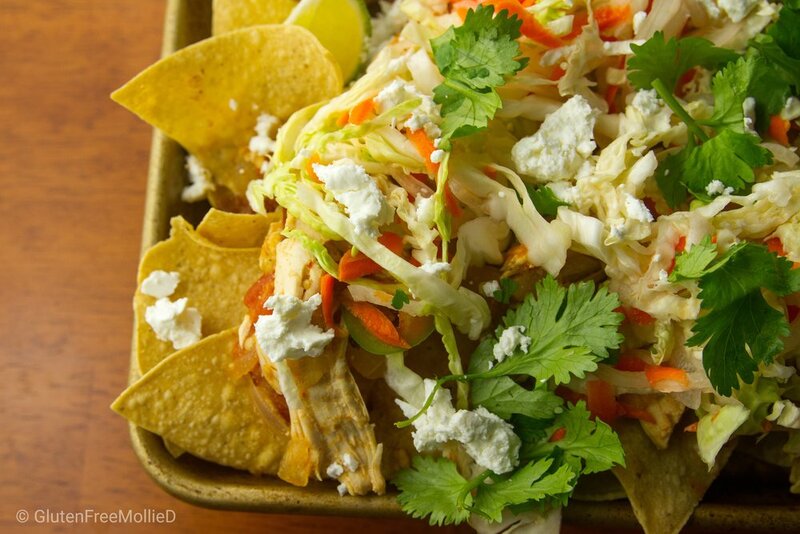 Some Mondays we go meatless, some Mondays we go seafood, and some Mondays we go nachos. Yup, in honor of football season finally underway, we decided on a very un-Mondayish meal (for us) and made Chicken Tinga Nachos. And I am so glad we did! My fondest memories of nachos involve heaps of chips covered in gooey, possibly-fake cheese, salsa, guacamole, black beans, jalapeno slices, and you know, the regular semi-traditional toppings. So imagine my surprise upon eating these nachos, which were far more refined with no fake cheese in sight, and realizing they were just as delicious, if not more, than my previously noted “junky” nacho passion. Don’t get me wrong, I was a little skeptical of this healthy-ish platter, but I was quickly won over by the incredible flavor from the chicken (poached with tomatoes and onions), delightful crunch of the cabbage slaw, and impressed by the sprinkle of goat cheese and cilantro on top. So many ingredients and flavors you’d never expect on a pile of hot tortilla chips, but oh wow was it good. Too good! 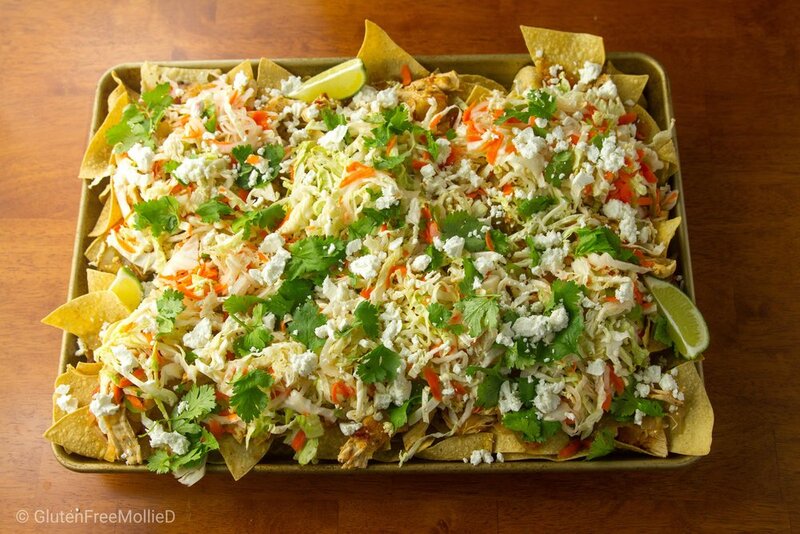 We had to stop ourselves from eating the entire sheet pan of nachos. It wasn’t easy, but the promise of leftovers for Seth was strong enough that we made sure to leave a fun portion for his lunch. This first non-traditional-nacho-night was a major success! I cannot wait to try the countless other delicious-sounding options from my new nacho cookbook. Who knows how many healthier-than-usual nacho recipes we’ll find! We go back and forth on Tuesdays between tacos and pasta. I’m not sure how it’s almost always one of those two options, but our weeks seem to pan out in that manner the majority of time. And this week we had pasta! For those wondering, I’m sure it’s a few of you, I think the book Back Pocket Pasta by Colu Henry, is a pasta-filled wonderbook. Packed with pasta-feature dinners organized by location and style, she offers page after page of meals focused on this simple ingredient made in so many ways with some many ingredients I basically salivate while reading the table of contents. Every dish looks delicious and every meal comes together very quickly. That’s the bonus of this book: every dinner seems to be designed to be a weeknight winner. And that’s fabulous. 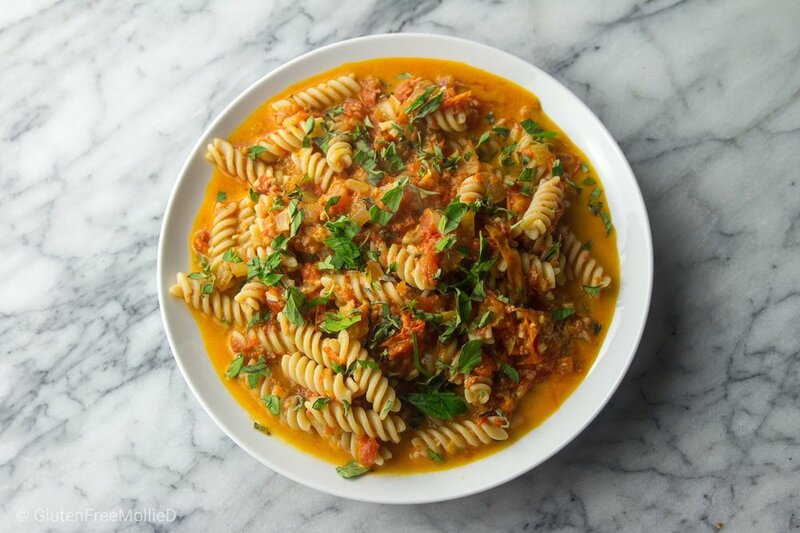 This week’s pasta dish, Smoky Garganelli Alla Vodka, was one of those meals you anticipate being so heavy (hi, creamy + spicy vodka sauce), leaving you curled on the couch afterward unable to do more than passively flip through the channels. But not this time! Not this dish! Slightly spicy, somewhat creamy, a bit smoky, and a lot of yum, I loved how this dinner was much lighter than I expected. Yes, it had a cream-based tomato sauce, a flavor everyone loves and loathes, but it somehow wasn’t overpowering and didn’t leave me feeling heavy or worried at all. Of note: we could not find GF garganelli (someday!) so we used GF fusilli from Jovial Foods. The second half of our dinners for the week came from another new cookbook (brand-new!) and honestly, now that we’re two recipes in, I am eager to make every meal in it. Julia Turshen’s second cookbook, Now and Again, is wonderfully organized by season, offering full menus for any number of occasions, even just a regular weeknight, plus ways to reinvent the leftovers from every single one of those dishes. Wow! While we haven’t gone too far into the book yet, I just know this will be another permanent fixture for our meal plans. What’s heartwarming about this book, don’t worry I’m getting to the food, is that she incorporates so many stories about her family and why each recipe is important to her. For me, that makes the food taste even better. I love great food, but if I know the story behind that garnish or grain or protein, all the more reason to appreciate it even more. Our Wednesday selection, Grilled Beef and Zucchini Meatballs with Tahini Dressing,was just awesome. Quick to prepare and easy to assemble, I could imagine this dish being part of a larger party menu, or served on its own, like we did, but with a light salad as well. No worries if you don’t have a grill, Turshen suggests broiling or roasting the meatballs to attain a similar flavor profile. We broiled the meatballs and that worked perfectly. It had been a while since we’d used beef for meatballs. Holy meatballs, beef is delicious. We don’t buy ground beef that often, not sure why, because now I’m going to fill my freezer with it in case we need to make this dinner on a moment’s notice. Another night of meatballs that I can’t get out of my mind, I’m pretty sure my first book will be titled “Mollie’s Meatball Manifesto” because I freaking love them, in every shape or form. If there’s anything I sometimes consider avoiding, it’s proteins formed into certain shapes, and then baked. I’m looking at you, meatloaf, and wondering how is it that this bland-word dinner could ever become something I’m now excited to make again and again. Joke is on me though because my mom makes a killer meatloaf (it’s topped with mashed potatoes!) and I should have known that someday I’d be having it (albeit a different version) in my home, as well, and be just as delighted. Please don’t think I’m anti-meatloaf. Because I’m not. I’m just wary of the word. Much like other words that make me nervous (pretty sure monkfish will always make me skittish), meatloaf is a word, and meal, that I never really anticipated making in my own home let alone devouring it off my plate. But here we are. Eating meatloaf. In our apartment. Happily. Welcome to growing up, right? The title of our dinner, Confetti Meatloaf (also from Now and Again), was enough to get me excited. I love confetti in general so the prospect of somehow injecting that joyful experience of throwing it all over the place into our dinner was pretty thrilling. For those of you who don’t enjoy throwing confetti all over your home with reckless abandon, just know that in this instance it means mixing sauteed peppers and onions with the meat before forming the loaf and baking. As you’ll notice in the photos, the meatloaf has a “confetti-ish” appearance when sliced. Hooray! As an alternative to classic mashed potatoes, we tried the Creamy Garlic Cauliflower which was one heck of an alternative. Basically the same consistency and almost-the-same flavor to potatoes, I felt much healthier having cauliflower with the meatloaf especially since I wanted more than one serving. Not to mention the whole meal was heavenly delicious, this meatloaf and mashed cauliflower was easy to prepare and very weeknight-friendly. 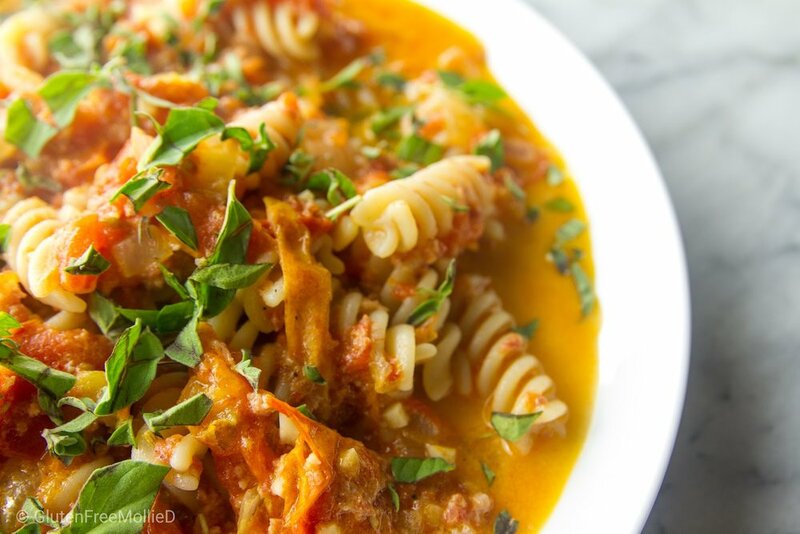 Once again, it was a naturally gluten free recipe which made us even more excited to make it. This author continues to offer dishes that require no modifications. Even more reason to continue cooking through the book! Stay tuned because I know this book will be making frequent appearances in our upcoming meal plans. Well, after a week of meals like that how did we greet the weekend? By going out for dinner, of course! Yes, it’s true. We cook all week and then go out on the weekends. I find it to be a good balance so that we’re always excited for both (and never tire of either). We went to a ‘burbs favorite, Il Casale, on Friday night where there are plenty of GF options and a friendly staff that will always accommodate my dietary needs. I’d share a photo, but I forgot to take them! Sign of a good meal, right? Besides going out to eat, we had a somewhat calm couple days that included a long walk around our neighborhood, shopping for new jeans (yay! ), and doing our Sunday usual of meal planning and grocery shopping. I love a good routine and our Sundays always tend to look fairly similar. However, now that football is back we always try to be a bit more efficient so that we’re home in time for kickoff. How do your weekends look once the “school year” has begun? I find that we keep them a little more low-key and that’s A-OK with me. Not that either of us are in school, not even close, but I think the weeks feel busier, which encourages slower weekends filled with great food, time outside, and actually taking time to relax. We hope you had a wonderful weekend filled with the foods and activities you enjoy the most! 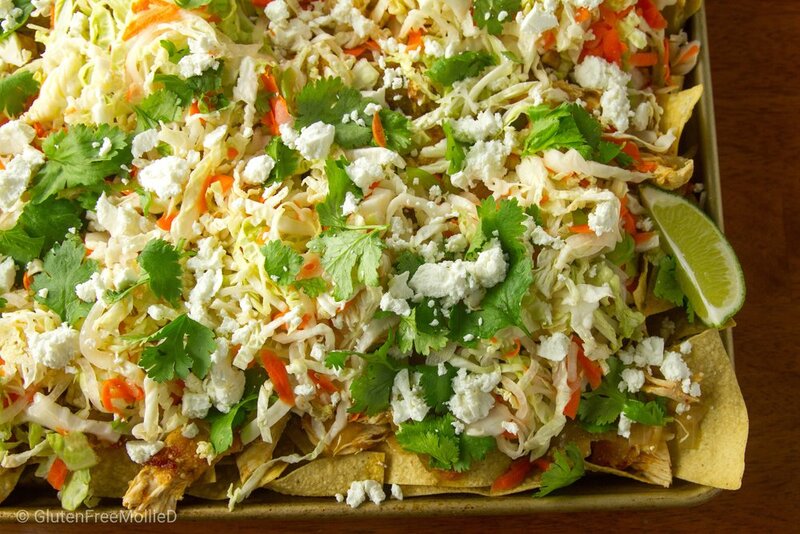 Chicken Tinga Nachos: A naturally gluten free meal as long as you use GF corn tortilla chips. Recipe is available in the book The Nacho Manifesto by Jack Campbell. Check it out, here! Smoky Garganelli Alla Vodka: Just make sure to use GF pasta for this one! Otherwise, it’s all gluten free. Recipe is available in the book Back Pocket Pasta by Colu Henry. Check it out, here! 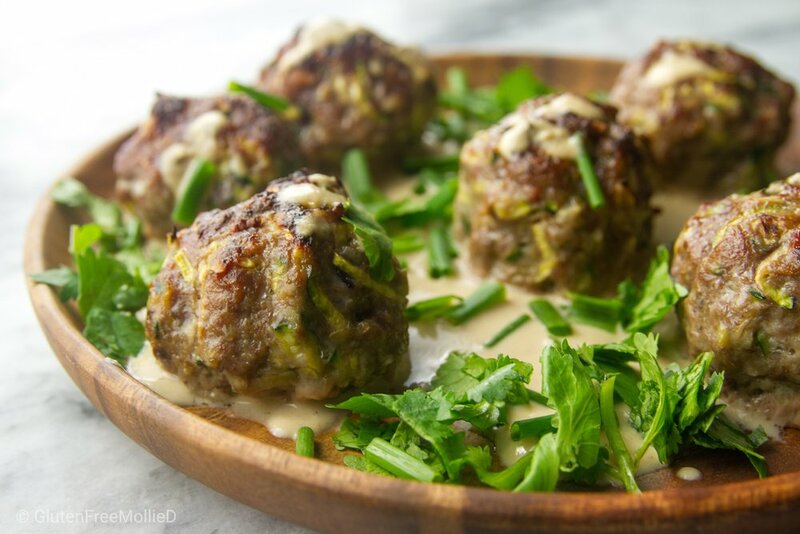 Grilled Beef and Zucchini Meatballs with Tahini Dressing: A naturally gluten free dish that didn’t need any modification. Recipe is available in the book Now and Again by Julia Turshen. Check it out, here! 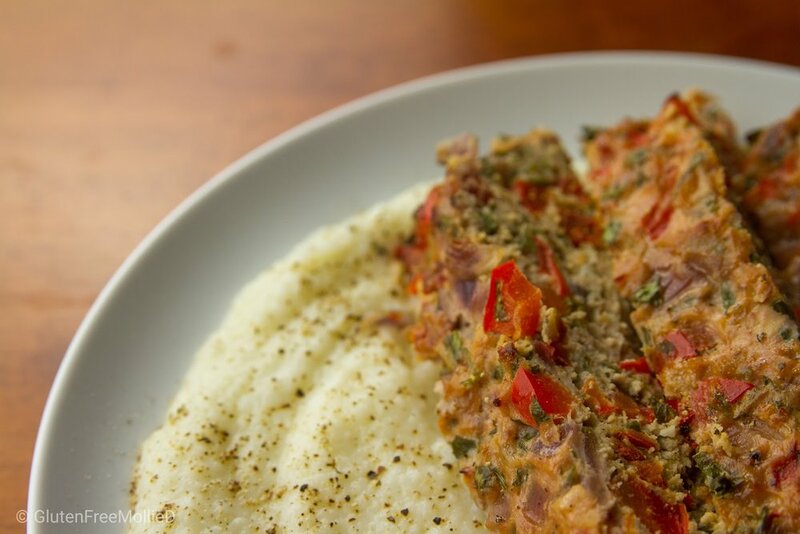 Confetti Meatloaf with Creamy Garlic Cauliflower: A gluten free pair of recipes that did not need any modifications. Recipe is available in the book Now and Again by Julia Turshen. Check it out, here!